William Kenneth Cornell a.k.a. "Bill"', was born at Goondiwindi on 9th May 1921, the second youngest of 11 children. 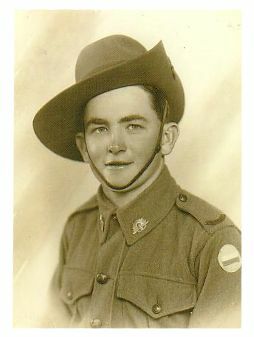 He was living in the Ipswich district when he joined the Army in June 1941. His original Battalion was destined to go to the Middle East, but Bill requested a transfer, and joined the 2/26 Battalion, the Battalion to which an older brother belonged, during their training at Bathurst. Bill and his brother were members of the same company, and shared many of their war time experiences, including both being part of the notorious "F" Force, working on the Thai-Burma Railway. Unfortunately, his brother was to die on a train enroute to one of the POW hospitals, and is buried at Thambuzayat. Bill married not long after his arrival home aboard the "Largs Bay", and managed properties in the Wandoan district for several years. In July 1954, the family moved to Chinchilla, to enable Bill to take up a position with Green & Co., Stock Agents, which involved long hours of driving to branches in the Roma, Cunnamulla, Charleville and Injune districts. After several Company amalgamations, Bill became Manager of Moreheads,then of Elder Smith Goldsborough Mort, until his promotion to Branch Supervisor of South East Queensland, which facilitated a move to Brisbane, where he continued to travel to his branches in the country on a fortnightly basis until his retirement at age 65. During his retirement, he built houses together with his son-in-law who is a builder. He also became a very active member of the 2/26 Battalion Association, where he helped organise reunions and visited and gave support to his sick mates. Together with two other Battalion members he was instrumental in establishing the twice yearly commemorative services at The Garden of Remembrance of Pinnaroo Lawn Cemetery. Every week, until just months before his death, he would catch public transport to the Cemetery to place or replace poppies on the plaques honouring Battalion members. He contacted family of deceased members to advise and assist them on having their loved ones recognised on the Memorial Walls, and as a result of his time and devotion to this cause was rewarded with a story on a local television program and comprehensive write ups in local papers. His work was also recognised by The War Graves Commission in that he was consulted and advised of the building of new walls and invited to various functions held at Pinnaroo. After a short illness, Bill died in Brisbane on 20 March 2007. He is sadly missed by his wife, children, grand-children, and all members of the 2/26th Battalion Association.